Feel like there are too many online offerings asking you to set up a ‘profile’? Aside from your Facebook, Twitter, LinkedIn, Google, Skype, Apple (the list goes on) profiles, it seems there is an increasing number of web tools/services wanting to jump on the social profile train. The reason: To improve the user experience for their consumer? To get a hold of as much user data as possible? Or to fit in with what is quickly becoming the norm – allowing consumers to have a persona, rather be seen just as ‘users’ (because, really, being referred to as a ‘user’ doesn’t field particularly nice connotations). While we’ve become well-accustomed to having social network personas, it feels as if our online lives are beginning to be saturated with profiles. For example, social scoring site Klout recently underwent an update to support user profiles that have the design and feel of social content management systems we’re familiar with. On top of scoring your social ‘klout’, you can manage your social accounts as well. In essence, a profile to manage your other profiles! Another example is Bitly, an online URL-shortening service I’ve been using for years. Built around ‘Bitmarks’, or bookmarked links, Bitly allows you to “save, search, and organize all your links from around the web, coupled with the ability to group links into bundles, share them”. What’s interesting is it offers consumers a ‘profile’ to manage their social interactions and links. For example, if you don’t want certain links or bundles on your public profile, you mark them as private. When are people going to have enough? 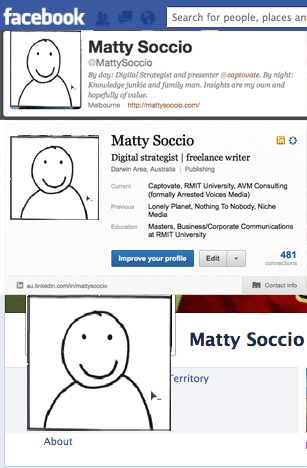 How many profiles are too many? Yes, the content management side of a profile makes it easy for people to post/share/comment on content, but do all online tools need to offer member profiles? Are we in danger of ‘over-profilism’? While the allure of customer data is great, carefully consider how your ‘user’ is utilising your tool/service and think about the already-cluttered social environment that exists online.